Signing off. 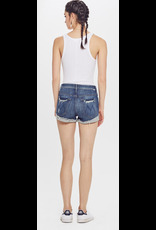 MOTHER was sporting her denim cuff shorts as she peeled out of the parking lot. No one knows when she'll be returning to office. Made in Los Angeles.